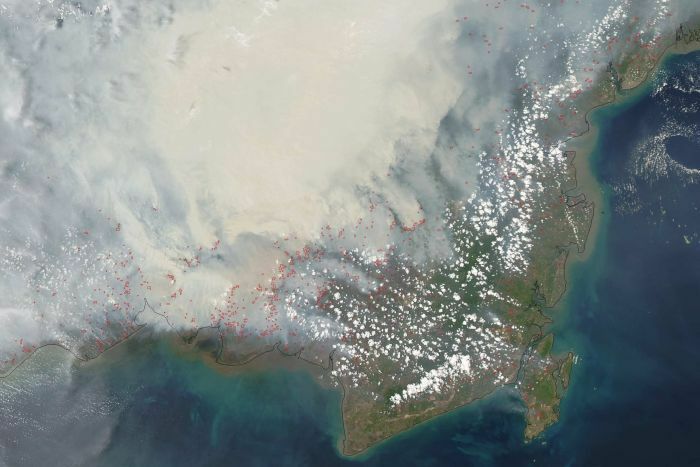 Heavy smoke from peat fires are continuing to blanket Borneo and many surrounding regions across Indonesia, as shown in the image taken by NASA's Aqua satellite. The red dots indicate hot spots where the satellite's sensors have detected unusually warm surface temperatures caused by existing fires. The fires were started by farmers engaged in slash and burn agriculture, a technique that involves burning of virgin rainforest to clear the way for commercial crops such as oil palm and acacia pulp plantations.